David Cameron’s front page of the Sunday Times announced a concerted Government anti-discrimination drive. Targeting universities, the police, the courts and the armed forces he said steps must be taken to tackle the ongoing discrimination that “should shame our country and jolt us to action”. Controversially he claimed that “if you’re a young black man, you’re more likely to be in a prison cell than studying at a top university”. There is evidence that suggests that BAME candidates are less likely to receive offers from elite universities. Perhaps requiring universities to “publish admissions and retention data by gender, ethnic background and socio-economic class” would help this. What analysis has the TUC done? However, TUC analysis shows (and this has also been found by other research institutions) that education is no safeguard against unfair treatment in the workplace. Our analysis released today considers the pay gap by educational attainment through examining the Labour Force Survey. We analysed the data going back 4 quarters at a time to 2011 (due to changes in the measure of ethnicity this was the furthest we could go), in order to reduce the issue of seasonality and statistical noise. We chose to focus on gross hourly pay, as this is the methodology used to calculate the gender pay gap. This actually hides the extent of the problem, as it does not take into account the hours worked by different ethnic groups. 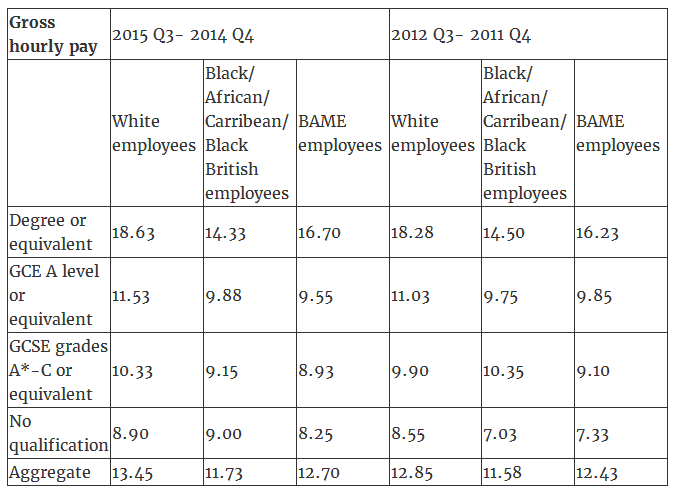 Given a big problem for BAME employees is casualization (where they are more likely to be employed on temporary or part time contracts), using weekly, monthly or annual pay would have made for a more striking story. 1. The pay gap is getting worse. We were only able to analyse the pay gap over 4 periods, which is obviously unfortunate. However it feels that David Cameron should have raised the issue of “ingrained, institutional and insidious” disadvantage sooner, given that it appears the pay gap has been getting bigger. It is clear to see that in general pay discrimination remains entrenched, with the overall pay gap of 5.6 per cent for BAME workers and 12.8 per cent for black workers being the widest it’s been over the periods examined. Whilst equality of opportunity is a commendable goal, it cannot be achieved through education alone. Working hard to gain qualifications in further education, higher education or even a degree might increase actual pay but doesn’t increase equality. Our analysis has shown that a black graduate worker can expect to be paid an astonishing 23.1 per cent less than their white counterpart. With a £4.33/hour difference, that can quickly add up to huge differences in quality of life. As David Cameron said “I don’t care whether it’s overt, unconscious or institutional – we’ve got to stamp it out”. However, the policy agenda cannot end with fair university admissions. Given that the gaps are widest for those with highest qualifications, education alone will not fully address inequalities in the workplace. This post originally appeared on ToUChstone and is cross-posted here with permission. Work areas: Economy and Industry, Inequality. Tags: equality, fair economy, income, inequality, race equality, wage gap, workers rights.